Inspiring audiences to look at everyday challenges in a new light! “I’m No Hero” is the story of Captain Charlie Plumb, but it is also the story of all P.O.W.’s who faced an isolated world of degradation, loneliness, tedium, hunger, and pain. It is a story of hope, suggesting that the techniques used to survive extreme conditions can be applied to overcome the struggles of day-to-day living. One of the most sought-after achievement speakers of his time, Captain Plumb’s presentations are as he is: sincere, straightforward, humorous, and tailored to motivate each specific audience he encounters. His insights on how to cope with the difficulties as well as the opportunities in life have a positive impact on those who hear his message, those who read his books, and those who come to know him as a friend. Captain Charlie Plumb graduated from the Naval Academy at Annapolis and went on to be a fighter pilot flying the F-4 Phantom jet on 74 successful combat missions over Vietnam. On his 75th mission, with only five days before he was to return home, Plumb was shot down, captured, tortured, and imprisoned in an 8-by-8 foot cell. He spent the next 2,103 days as a Prisoner Of War in communist war prisons. During his nearly six years of captivity, Captain Plumb distinguished himself among his fellow prisoners as a professional in underground communications, and served for two of those years as the chaplain in his camp. 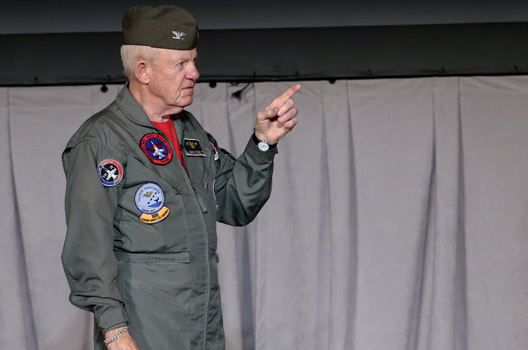 Since his return home, more than 5,000 audiences in nearly every industry have been spellbound as fighter pilot keynote speaker Captain Charlie Plumb shares his story and the lessons he learned from it. I was recently privileged to see and hear Capt. Plumb in person. I must say, he is by far the most gifted, inspiring speaker walking this planet! I thought I had “seen everything and heard everything.” I sat there dumbfounded hearing this man’s heroic story – and understanding how my life is better because of the lessons he learned. I consider getting the chance to hear his message, in person, one of the greatest privileges I have ever had, and probably ever will! My whole life was changed by Captain Plumb’s inspiring talk about choices and attitudes! I came to our meeting ranked 37th in my area; within the year, I was the “2nd Top Performer” in my company. God bless! Thanks to Captain Plumb’s riveting speech and analogies, I was able to take away something more than how to succeed in the corporate world. I was inspired to see how blessed I really am, and have a new way of viewing life and it’s obstacles. Captain’s messages will play a role in my life every time I face hardship, and happiness.